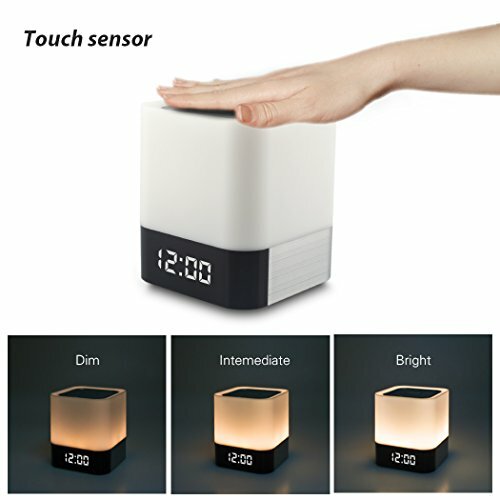 ✔4 IN ONE Super Multifunctional ----Bluetooth Speaker + Touch Sensor LED Lamp + Digital Alarm Clock + MP3 Player . Connecting with Bluetooth 4.0 super easily and fastly , compatible with all Bluetooth devices. 3 Levels brightness adjustable LED table light with cool touch sensor design on the top,adjustable 12/24h system digital alarm clock, and sleep mode. Can be used as MP3 Player with flash drive /micro SD Card input, AUX input. ✔Night Lights For Kids or adult---- 3 Levels Brightness: dim, soft, and bright white light. Touch the top , one touch, two touch ,three touch... full control the light Brightness and power on/off.Table lamp with classic white design, soft lamplight take you into sweet dreamland . portable sleep mode night light can be used for relaxing, traveling, living room, bedroom reading, kids night light. ✔Wonderful Sound Quality ----the portable bluetooth speaker is with High power woofer , Unique Bass technology, No matter Bluetooth connection or MP3 play ,or AUX connection , you will enjoy amazing sound , suitable for kids, adult, party, yoga, living room, bedroom,and go camping. ✔The Best Gift---- Multi functional creative and modern design make it to be your best gift for any occasion, such as used for Yoga music player, in friends party,having a romantic dinner,camping outside with family and friends, Christmas Day , Easter Day , Thanksgiving Day , Birthday, anniversary, Mothers Day , Fathers Day , Halloween , wedding, etc. "WamGra" is registered Trademark by our company,this brand is only sold in WamGra shop.